Hh dear.... I've been let loose with the bank card again! I always get the urge to splurge and this month I have succumb to that ever-so-present beauty blogger itch and treated myself to a few new bits and bobs! Some of my favs re-purchased and some brand spanking new things I will no doubt fall in love with aswell and I thought why not let you girls and boys have a cheeky peek inside my shopping bags! Sorry for the pretty pants photos - it is my mission of the next few months to really try and improve my blog's content and photography, hopefully you will be able to tell the difference soon! First up the make-up.... those bits I expect you are all probably most interesed in! I'll start at the top and work my way along! Nivea is easily one of my favourite bargain drugstore brands so when I spot a newbie enter their collection I have to get my hands on it! Lip balm's are a must for this time of year and although I already own about 42 million I couldn't help but be sold buy the words "new" and "watermelon" - this smells lovely and has a lovely pink tint to it aswell! It came to my attention that although I wear alot of fuchsia's and bright pink lip colours I don't have a lip liner that goes with them and with the classic £3 off voucher for No7 this seemed like the perfect bargain. It's a gorgeous pink which blends with some of my favourite lipsticks so well! This is a must for me - use it daily and have probably gone through about 203 in my lifetime so far. A newbie from the high street, Seventeen have bought out a contour kit yippee! and although I'm totally happy with my one from Sleek I couldn't just walk past this and not pick it up! A gorgeous bronzer alongside a shimmering highlight, I know that I will get so much use out of this! Another repurchase - this is one of my go-to everyday foundations, I'm near enough always wearing either this or L'oreal's True Match. Bourjois Rouge Edition Velvet Lipstick - Ole Flamingo! Seeing as Bourjois was on two for £14 I had to pick up something else (obviously) and I went for this little beauty! Having seen sooo many people posting selfies with a gorgeous lip colour and soooo many times seeing it is this shade I finally decided to grab it! It's a lovely matt pink which I know I'm going to be wearing alot over this next season. You've seen been rave about this countless times! The best concealer I've ever used I go through sooo many - I've even got my Mum using it now! It was about time I purchased some new darker nail polishes! I recently did a huge clearout out of products and things and lots of nail polishes didn't make the cut so it was time to stock up on some newbies! I like having cheap lipglosses in my bag especially for work days, these smell amazing and were only £3.50 for 2! Now a few skincare buys - which I definitely probably didn't need but you know what us girls are like...you can never have enough! I got through so much of this stuff! I use it every evening and swear by it! This was actually on clearance at only £5.50 so I grabbed it! It is for oily sensitive skin which is perfect for me at the moment as my skin as taken a greasy turn for the worse, I'm really looking forward to trying ti out as I have heard such great things about this brand! This stuff has become a total life saver so it was time I stocked up on some more! This is amazing for dry/irritated skin I highly recommended it! The first of the face mask's now and one that I haven't tried before! I am obsessed with trying out new ones and this was so cheap I thought it it was worth a go! Something that will last more than one use aswell! This will come as no surprise to you regular readers - I buy these like they are going out of fashion and as they were on 3 for 2 in Boots I grabbed a handful! I got 3 of the creamy coconut, 1 hot sauna, 1 hot chocolate and 1 nut oil! All have been reviewed on here before so if you want to read more then just search them in the search bar on the right! I've bought these before and loved them, this new collection from Garnier is doing so so well, I've seen everyone picking them up! I love the scent, coconut is the best for me when it comes to haircare! The Sleek Restorer really does work aswell making my hair smoother and frizz-free... for once! After seeing VelvetGhost's September favs video and watching her rave about this stuff I decided to give it a go myself! I have used it so much already and am LOVING it - I'm sure it will be mentioned again on here soon! More coconut goodness! These are the best value for money hair mask's ever! £1.99 each or 2 for £2 on offer - I bought 4! I use this a couple of times a week and it leaves my hair so shiny and smelling great! Probably my favourite oil I've ever tried, it is a tad more expensive than others I have but I only use it after I've washed my hair so maybe 3 times a week! BORINGGGG I bought a new razor coz' it was half price... nothing more to say haha! Yayyyy I finally got some Zoella Beauty bits! Keep your eyes peeled as these are going to have their very own post very soon! I've nearly burned this whole thing already! It's so cute and smells lovely! Like I said above... a full review will be coming soon! Well... we all need to brush our teeth don't we! I love all your buys! The bourjois lipstick is a favourite of mine! I love the Garnier Ultimate Blends range & the Zoella body mist! Have such an urge to go shopping after reading this! Working at Superdrug it's SO hard not to give all of my pay back to them because I'm constantly surrounded by bits and bobs that I'd love to own! I adore the seventeen makeup range, it's so well priced and I'm always so impressed with the results. I've wanted to try those Bourjois velvet lipsticks but I can't find a colour to suit me! I love the purifying foaming gel - it smells amazing! Love a good skin care skin product post! Love your blog! New follower here, please check out my blog? Great Haul. 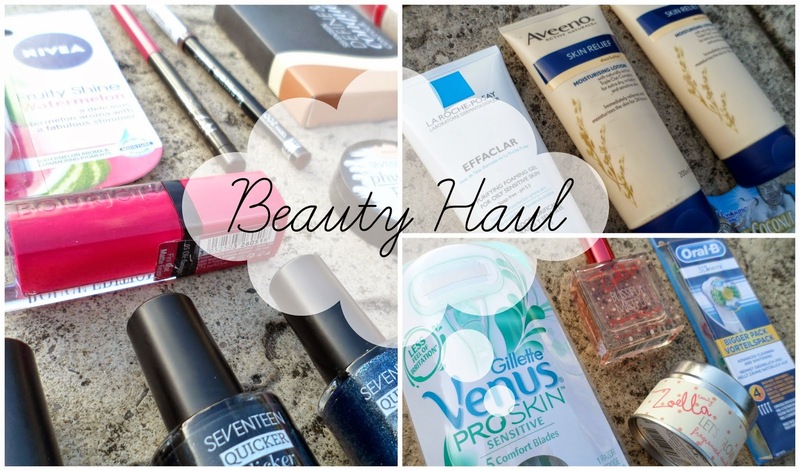 Some really good products! I'm a huge fan of Ultimate Blends! Vanillla and Papaya are amazing and smell gorgeous! Those nivea balms are one of my favorite))) And of course their lip butters))) Also like that masks! So excited for the review of the Zoella products!!! I've been itching to get my hands on some!